BM91598H Quality Replacement Type Approved Exhaust Manifold Catalytic Converter. INFORMATION ABOUT THIS CATALYTIC CONVERTER. BM91598H Quality Replacement Type Approved Exhaust Manifold Catalytic Converter This exhaust part is guaranteed for 2 years and is available from stock. It corresponds to the following references from other manufacturers: 322543 090-559 28104 VX6080T 12992393 Fitting kit available? FK91598 FITMENT AND COMPATIBILITY GUIDE This catalytic converter fits the following vehicles: ALFA ROMEO 159 1.8i 16v (939A4000 engine) 03/07-11/11 CHEVROLET TRACKER 1.8i 16v (A18XER engine) 6/12- CHEVROLET TRAX 1.8i 16v (A18XER engine) 6/12- FIAT CROMA 1.8i 16v (939A4000 engine) 11/05-12/11 VAUXHALL ASTRA 1.6i 16v Mk. 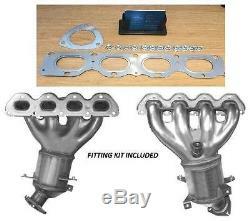 5 (Z16XER engine) 1/04-4/11 VAUXHALL ASTRA 1.8i 16v Mk. 5 (Z18XER engine) 10/05-4/11 VAUXHALL MOKKA 1.8i 16v (A18XER engine) 6/12- VAUXHALL SIGNUM 1.8i 16v Mk. 5 (Z18XER engine) 8/05-4/10 VAUXHALL VECTRA 1.8i 16v Mk. 2 (Z18XER engine) 8/05-4/10 VAUXHALL ZAFIRA 1.6i 16v Mk. 2 (Z16XER engine) 12/07-4/11 VAUXHALL ZAFIRA 1.8i 16v Mk. The team at RSJ is highly skilled, with many years of experience in the motor parts trade. We have over 100,000 parts with low pricing, excellent availability, and reliable, honest customer service. We don't advertise what we don't have. The item "VAUXHALL VECTRA 1.8i 16v Mk. 2 (Z18XER eng) 8/05-4/10 Exhaust Catalytic Converter" is in sale since Friday, August 25, 2017. This item is in the category "Vehicle Parts & Accessories\Car Parts\Exhausts & Exhaust Parts\Catalytic Converters & Parts". The seller is "rsj-carcare" and is located in Bilston. This item can be shipped to all countries in Europe, United States, Australia.